Thread: Action Pics? ?--How do you do it? Well, I mean I know how to point the camera and all, but when we ride, we never stop at the neat and gnarly places and take shots. Besides, we're just a bunch of old guys whose stuff probably wouldn't be that dramatic anyway...right Zedro? 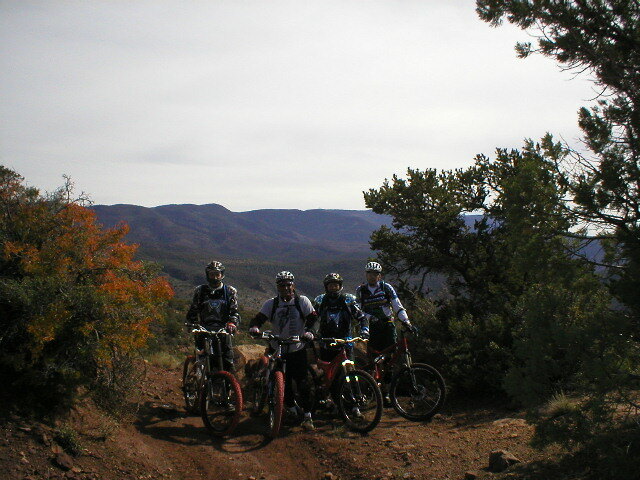 Anyway, here's a posed pic (the only pic) of a bunch of us this weekend on the A-trail from Cloudcroft New Mexico down to Alamogordo NM. Anyone here ever ride that one? That last 4 miles of the descent had me crying for my mama--as one of the other guys described it...a controlled slide. Yeah, it's a pretty lame pic in light of all these Rampage shots and youngsters at their dirt jump locations, but hey...we're old...LOL! Additionally the only shot of mine that any usually see around here are either in my workshop or one of my bikes leaning against the outside wall. Well...at least here's one with me on a trail...(geez, I hope they don't notice the chopper that actually dropped me on this mountain). Anyway, the Geritol group you see is me on the left (53), next is a retired career army guy (53), next is another retired guy (59), and the child on the far right is a retired USAF guy (45). Oh...I'm retired too, except for this lousy part-time job I got at a bike shop to pay my medicare premiums and bike parts. at least you still ride. Ain't riding in New Mexico grand(e)? We're freezing our arses off here in Los Alamos, but oh well, the extra clothing required to keep warm inspires all the more confidence when taking drops. Keep riding and if you're ever coming to the hill, send a post! No kidding on the cold. I notice it's going to be 12 degrees tonight at Cloudcroft. We left late Sunday afternoon. Even then it was around the high 20's and low 30's camping out by the Rim trail on Friday and Saturday nights. New Mexico ain't half bad...LOL! that tanky Foes will probably still be in one piece when he's gone to the big dirt jump in the sky. Im shocked his wife hasn't off'ed him yet so maybe he will make it afterall. That is assuming the border patrol doesn't track him down for a good beating first! No no no. That's not how it works. You'll soon go over the hump and it's a gnarly slide down the backside. Keep drinkin' your milk, cuz bones only get more brittle, not less. on both fronts. Sometimes I just can't help myself. Apologies Mike, if'n I ofended you in any way. The only times I take pictures on DH runs is if we are taking multiple. Second to last or last run of the day we stop at a few spots and snap some. I don't like to kill the flow of me/the group on our first couple times down. The other pics I take are at session type spots. ......... Apologies Mike, if'n I ofended you in any way. Action Alert: Help Reopen Reynolds Park!